Bengaluru: Malayalis are all geared up to celebrate Vishu, the harvest festival that marks the beginning of the Malayalam New Year. The festival falls on the first day of Malayalam month of Medam and is all about new beginnings. On the day of Vishu, Sun is said to rise straight from the east and signifies Sun's transit into the first solar month. The festival falls in April every year and the day is celebrated as the beginning of harvest in other parts of the nation. It is said that Lord Vishnu killed Narakasura on the day of Vishu. Another myth is that Lord Rama killed Raavan on the day and Sun dared to rise from the east. Celebrations begin from early in the morning when family members wake up to see Vishu Kani, which represents prosperity and auspiciousness. The eldest member of the family blindfolds each person to open their eyes before the arrangement. 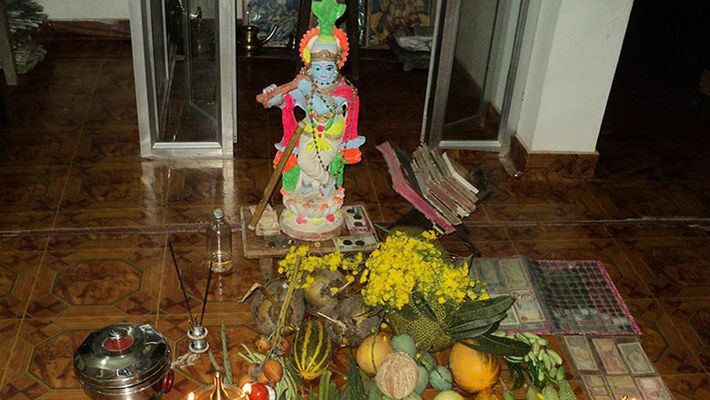 Vishu Kani includes idol of Lord Vishnu or Krishna, traditional oil lamp (Nilavilakku), Konna flower (Laburnum), betel leaves, betel nuts, coins, gold, silver, fruits, grains, yellow cucumber, vegetables, rice, coconut, new dress and a mirror that reflects all these things. The idea is to view it as the first thing in the morning which is believed to bring good luck and prosperity. After seeing Vishu Kani, the senior member in the family will give kaineettam, coins, to younger ones. Then the family members will gather to celebrate the festival by bursting fire crackers. The breakfast is usually Vishu kanji, a porridge made of rice, coconut milk and spices. In the afternoon there will be Sadya or traditional feast with all favourite delicacies.